Hello Ladies, you might have seen this post before, because a few weeks ago it was published as a guest post at The Country Chic Cottage. I wanted to have the post in my own archives too. So with permission from Angie I am reposting it here. If you have seen it already, move along. If you haven’t seen it: Enjoy! Today I thought lets share some ideas for gift wrapping that will look great under your Christmas tree. I love to scour the (French) flea markets in my region (I live in the Netherlands) and my craft room is bulging with vintage goodies I couldn’t pass up and had to take home with me. So for this years Christmas gift wrap I decided to just dive into my stash and use what I have. I love vintage doilies so much, they are so versatile. 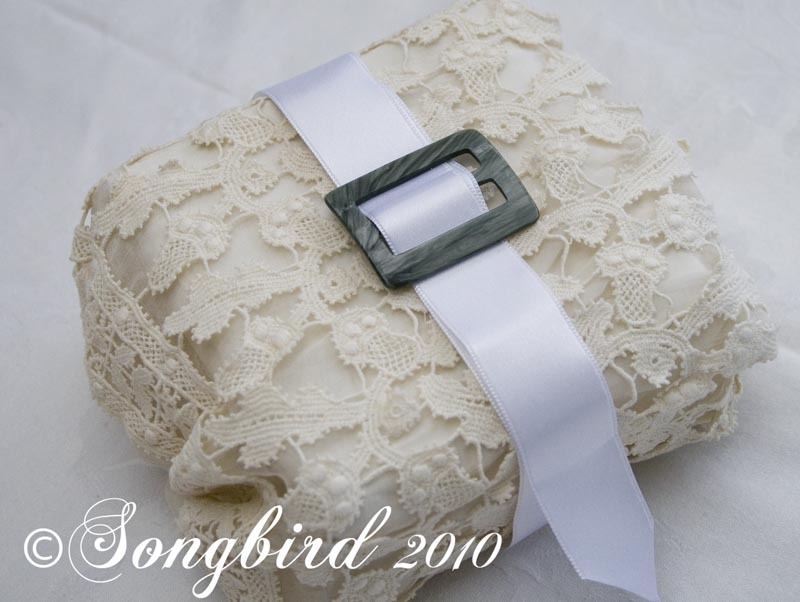 Just add a couple to a plain white package and you have instant glam. They do wonders for brown paper packages too. This one is definitely inspired by the Sound of Music (a Christmas-must-see-movie don’t you think) but I didn’t tie it with string but with a bit of ribbon and I added a little bling. Doilies are usually pretty easy to find. But if you don’t happen to have any around, tying different bits of ribbon and lace around a brown paper package works too. Don’t you agree that this looks lovely? Here’s another easy idea. This white paper bag is actually your everyday sandwich bag from the grocery store. But with an embossed gold Christmas stamp, some ribbon and a mother-of-pearl button, it definitely isn’t everyday anymore. 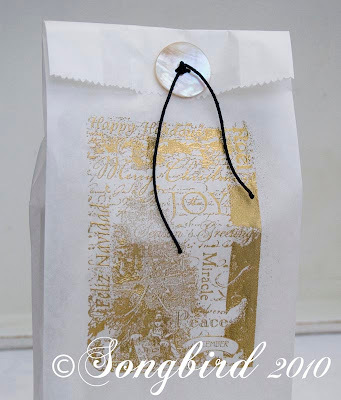 Paper bags are very easy to use and it takes very little to make them look nice. 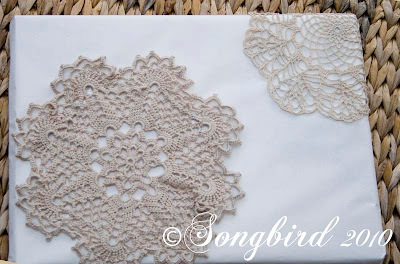 Here’s another idea of what you can do if you don’t have doilies. Paper doilies from the baking department work too! I added some gold stickers from my scrapbooking stash and an ornament from the dollar store. Really you can use anything like this. The next package is wrapped in what I think was a sleeve from a dress once. 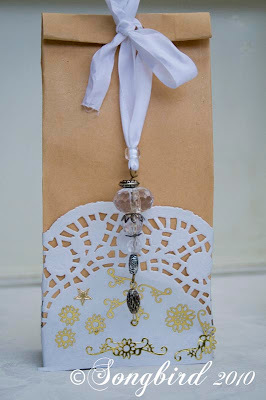 I wrapped the little box in a bit of white tissue paper first so that it’s colors wouldn’t shine through the lace. And I used an old belt buckle and some satin ribbon to tie it up. Tissue paper is very easy to use. Here I wrapped one package with tissue paper and some tea stained ribbon and added a gold pin for some extra glamor. The second package is a role with a Christmassy, vintage tag. But don’t be fooled by that vintage tag. 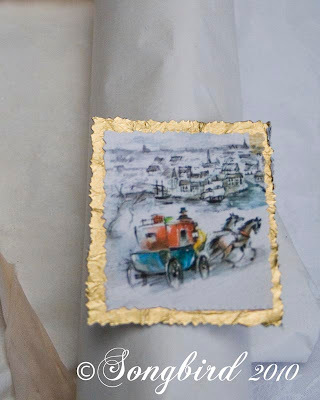 It is simply a bit of cardboard from a cereal box with a bit of gold paper from a candy bar wrapper and a vintage looking image from last year’s Christmas cards. Zero cost but looks great. Using old black and white photographs adds instant ‘vintagification’ too. 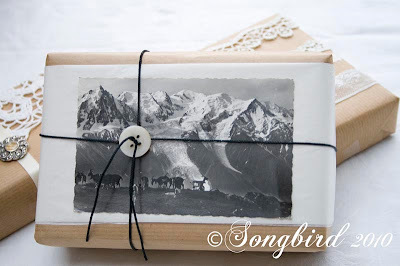 Just look for a winter image among your old family’s photographs or search on-line and print it out on card stock. They are great for making tags too! 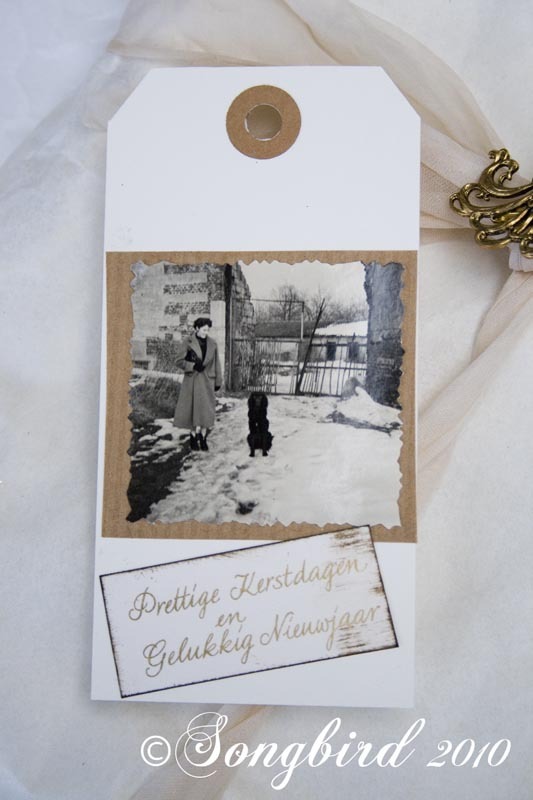 (oh and for your information ‘Prettige Kerstdagen en Gelukkig Nieuwjaar’ means Merry Christmas and a Happy New Year in Dutch). And all of these neutral colors go so well together….. 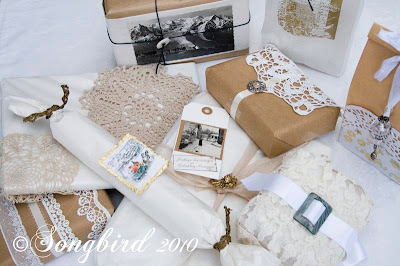 I hope I have given you some inspiration for creative packaging with a vintage twist! If you like these gift wrap ideas, you might like my 2011 Christmas Gift Wrap Idea in Read and White too. These are all so beautiful! If only I could keep my cat out of my gifts and pulling the bows and ribbons off, that would be wonderful! I, LOVE, LOVE, LOVE it! 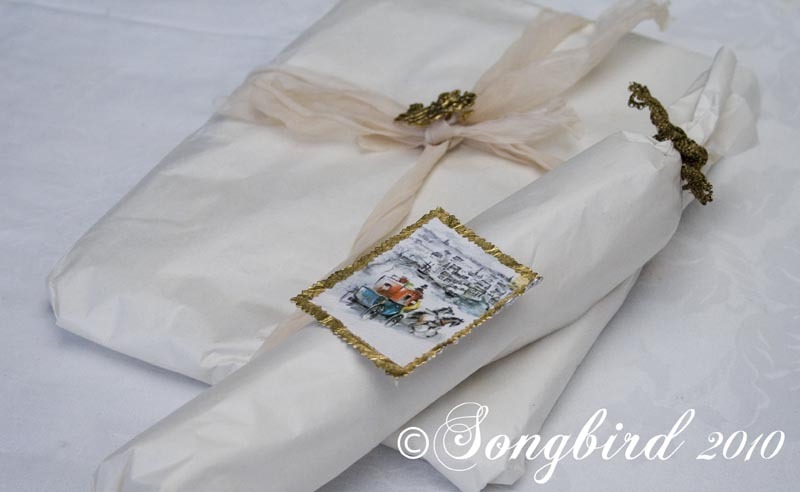 Thank you for sharing such wonderful gift wrapping ideas. I am definitely going now to see what I have in my stash! Marianne… those gifts are too pretty to open! Great job. I love the doily and the lace! Oh my whiskers!!!! Whoever gets those gifts is sooooo lucky! WOW! Inspired?!? You bet I am! I think I'll go wrap up some empty boxes for display. I see the question mark over your head….well stayed up until 5 a.m. this morning wrapping the last of the presents 🙁 Maybe I should start over 😉 It would be worth it – such loveliness!!! Thank you for sharing! Love these ideas! My girlfriends and I are having a get together next week to chat and wrap all our presents, I will have to show them these! Beautiful ideas, thanks for the inspiration. Glad to have found your blog via Kim's RT at Twitter this morning. Off to look around. 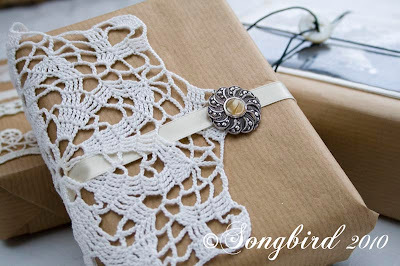 The doily+brown paper packaging is just lovely! Yes, lovely, ispiring, beautiful, brava…. all your things…Thank you..